After Peter’s and Matt’s insights on their Winvic experiences, today it’s the turn of George to speak all about his year in industry placement to date, working as a trainee QS on the landmark Segro Logistics Park East Midlands Gateway. George has been assigned to Plot 1, a 1,300,000 sq. 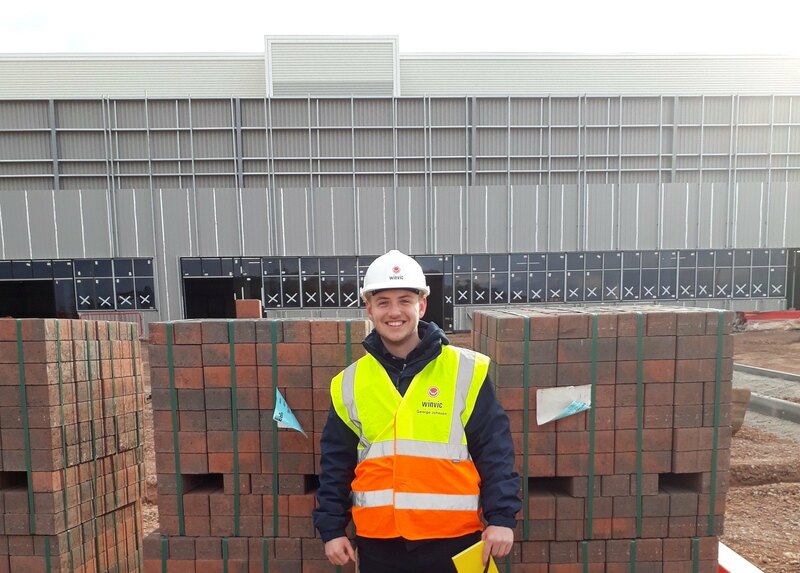 ft. modern industrial warehouse, from the start of his placement, four months ago, and has completed two years at Nottingham Trent University studying a degree in Quantity Surveying and Commercial Management. “I feel so lucky to be working on one of Winvic’s famous mega-sheds during my placement. I couldn’t have imagined working on a £61 million pound state-of-the art warehouse four and a half years ago, which was when I left school, not really knowing what I wanted to do. This journey all started at a school jobs fair for me, where I spoke a few people in construction, but I couldn’t see myself training to be a plumber or electrician like my brothers. My dad is in construction management and I’ve always been quite academic so I thought I had the skills to pursue a professional role in the industry. My college course, a Level 3 Diploma in Construction and the Built Environment offered me a taste of so many areas of construction, but everything fitted into place naturally – I was really good at maths and before I knew it I wanted to pursue a career as a QS. My mind is definitely suited to it.